Viking swords were expensive to make. They were typically double edged, but single-edged swords were also used. The blades were pattern-welded, a method of sword making where iron and steel were forge-welded together. Together with weapons such as the battle-axe and the spear, the sword was one of the most useful offensive tools for a Viking warrior. Viking swords were typically meant for single-handed use, with the other hand holding a shield. They were more than mere weapons of combat; a sword often indicated wealth and status. Also, these blades were heirlooms and given names and survived generations. Museum Replicas is proud of the variety of swords it offers. We carry a stunning range of Viking swords that would suit both the standard warrior and Viking royalty. We also understand that no Viking sword collection is complete without the Ulfberht, a weapon so ahead of its time it was considered mystical in some quarters. Our amazing replica does this sword justice. Also, check out the Migration Period Sword based on a 7th-century design and Eric the Red Sword that is inspired by the legendary Norwegian Viking. Of course, we have much more in this collection – blades forged with expert hands and with detail exquisite enough to turn the head of even the most battle-hardened Norse warrior. Although an authentic Viking sword is hard to come by, we will give you premium-quality weapon replica derived from those wielded by the most terrifying seafarers in history. This Viking sword has high carbon steel blade. Guard and pommel are silver, with copper lozenges. Grip is wood with silver pins. Comes complete with a scabbard. Overall 38-1/4 inches. One of the most significant medieval swords, this sports a high carbon steel blade. Grip is wood wrapped with leather. Scabbard included. Overall 35-3/4 inches. This sword has an extra-wide fuller and decorated crossguard with raised knot work. A matching period leather scabbard with belt is included, which has a highly decorative metal shoe. The sword has a blade made of 1065 high carbon steel. Features snub-hilt with disctinct lobed-pommel. Includes matching scabbard with belt stop. Overall length of 36-1/2 inches. This Viking sword has a high carbon steel blade with a wide fuller. 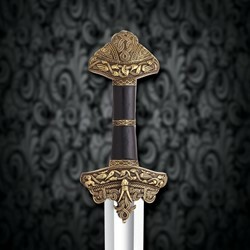 The pommel and guard have been lavishly sculpted with sea dragons and intricate knotwork. The wooden grip is covered in black leather and has three knotwork rings. Includes black leather scabbard with hardware and a leather baldric belt. The sword comes with a good edge and smooth finish, it is a bit blade heavy as this style of sword would be, and is not overly heavy. Very durable and would be hard to break. This is an excellent example of its type. I have owned the sticklestad, leuterit, and several other makes from this company and others. Ulfberht is the one I've kept, it handles the best for me. There is plenty of room in the grip while staying historically accurate. The inscription is correct, and sets it off while displayed on the wall. But hard use is where this sword shines. It is a great cutter with its spatulate tip, mrl did a fantastic sharpening service. This has held up well to the wooden pell, the tire pell, countless bottles, and tatami. In the shield wall, it would be a limb claimer! Really well done, outstanding value. I highly recommend this if you're in the market for a battle ready Viking sword.